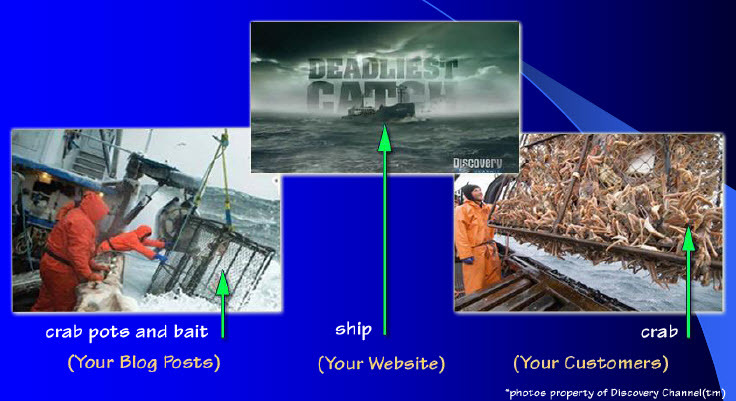 Social Networking: Let’s Go Crabbing! Social networking can be defined as services focused on building online communities of people who share interests, activities or who are interested in exploring the interests and activities of others. Think “Six Degrees of Separation” which is based on the idea that any two people can be connected through a chain of five or less intermediaries. Social networking allows for public awareness with an audience that is there waiting for you It’s absolutely critical if you have products or services and want to connect to your market, you need to be where that conversation is happening. And the rise of social media means that those venues continue to evolve. Remember that it does not replace traditional marketing, but a very effective and affordable tool in the strategic tool kit. The ROI is HUGE! Some businesses are reporting increases in sales by over 150% within the span of a few months after implementing social media programs. Social media provides the low risk/high return risk management factor for competitive advantage when a social media program is aligned with the business strategy. Facebook, now 250 million users strong, is a social networking website that was originally designed for college students, but is now open to anyone 13 years of age or older. Facebook users can create, customize and share their own profiles with photos, videos, and information about themselves. LinkedIn is a business-oriented social networking site founded in 2002 and launched in 2003 mainly used for professional networking. As of 2009, it had more than 40 million registered users, spanning 170 industries. Blog (short for “weblog”) is a type of website, maintained by groups or individuals with regular entries of commentary, descriptions of events, or other material such as graphics or video. Entries are commonly displayed in reverse-chronological order. “Blog” can also be used as a verb, meaning to maintain or add content to a blog. Put your strategy into a written plan or pictorial. Establish your social media presence. Properly maintain your presence in your social networking consistently and in alignment with your business strategy. Social media opens up a range of opportunities to leverage the power of word-of-mouth that is only limited by your imagination. Book Review: Full Steam Ahead! © Local Marketplace™ :: All Rights Reserved :: Do not duplicate or redistribute in any form.